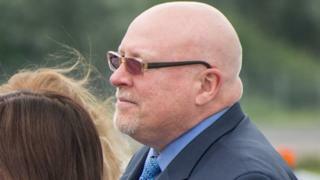 The US ambassador to Estonia is resigning, reportedly in frustration at remarks made by President Donald Trump about America's European allies. James D Melville said Mr Trump's comments on Nato and the EU had brought forward his decision to retire, Foreign Policy magazine reports. The magazine was quoting from a private Facebook post by the envoy. Mr Trump accuses Europeans of unfairly expecting America to shoulder the costs of the Nato alliance. He has also imposed trade tariffs on some EU industries. He had previously held senior diplomatic posts in several European countries and speaks Russian, German and French, according to his biography on the US state department website. A state department spokesperson confirmed Mr Melville's intention to resign on 29 July. President Trump reiterated his criticism of fellow Nato members on Friday while on a flight from Washington to his private golf club in New Jersey. He told reporters on board Air Force One that countries including Germany, Spain and France had to increase their financial contributions to the bloc. "It's not fair what they've done to the United States," he said. "The United States is paying much more disproportionately to anyone else." His remarks come less than two weeks before a Nato summit in Brussels.